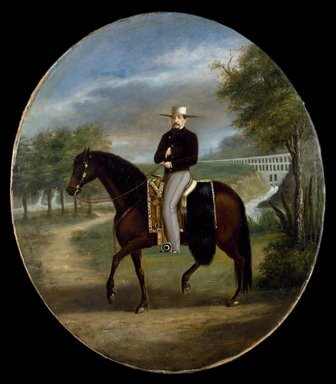 This oval equestrian portrait in oils of Don Manuel shows him dressed in the national "Charro" costume on a horse facing to the left. The saddle and accessories are still used today with variations in Mexico. He has black hair and a large mustache. He holds the reins in his left hand while the right one is in his vest. In the landscape background is the monumental aqueduct "El Sitio" part of his hacienda "Xalpa" which was started by the Jesuit fathers in Colonial times and which Don Manuel completed in the middle of the 19th century. He renounced his titles of nobility because of his liberal ideas. He served as Senator of the Republic and Governor of the Federal District (Mexico City). He was very fond of horses and his serapes are at the Museum. Condition: Good with some small cracks at the top.